Heredity: In many people, the tendency for ingrown toenails is inherited. Trauma: Sometimes an ingrown toenail is the result of trauma, such as stubbing your toe, having an object fall on your toe, or engaging in activities that involve repeated pressure on the toes, such as kicking or running. Improper trimming: The most common cause of ingrown toenails is cutting your nails too short. This encourages the skin next to the nail to fold over the nail. Improperly sized footwear: Ingrown toenails can result from wearing socks and shoes that are tight or short. 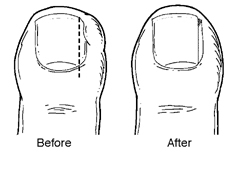 Nail Conditions: Ingrown toenails can be caused by nail problems, such as fungal infections or losing a nail due to trauma. Proper trimming: Cut toenails in a fairly straight line, and don’t cut them too short. You should be able to get your fingernail under the sides and end of the nail. Well-fitted shoes and socks: Don’t wear shoes that are short or tight in the toe area. Avoid shoes that are loose, because they too cause pressure on the toes, especially when running or walking briskly. Want more info about treatments for ingrown toenails from Arizona Foot & Ankle Physicians? Call our Scottsdale, AZ office at (480) 247-8443 to learn more!